Did you just drop over $100,000 on a 2018 BMW M5? If you did, I’ve got some bad news: it is now slow and dated. You should have waited for the BMW M5 with the Competition Package, which would make your stupidly powerful German luxury sedan one-tenth of a second quicker. The folks over at Motor1 did some digging into forum posts over at Bimmerpost and seemed to discover that BMW will soon be launching a Competition Package for the new M5. 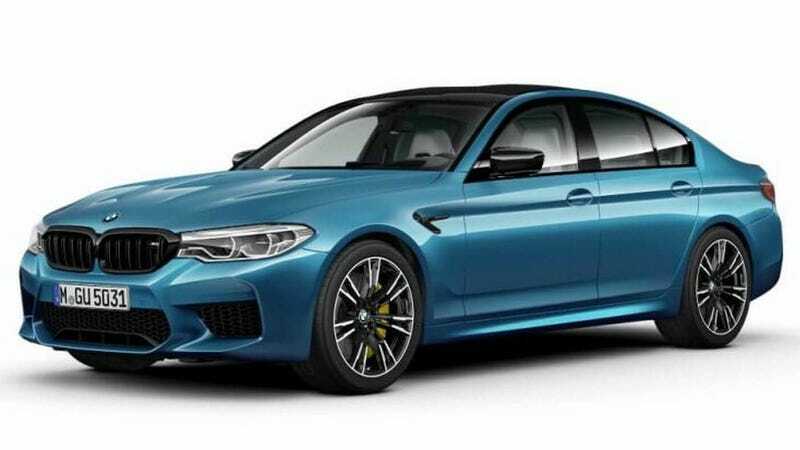 In addition to some cosmetic upgrades and an increase from the M5's normal top speed of 189 mph, the M5’s competition package will also add 25 horsepower and 37 lb-ft, bringing the total power figures to 625 HP and 590 lb-ft. The 0-60 time will dramatically drop from 3.4 seconds to 3.3 seconds. This will make the new M5 just a hair quicker than the Mercedes E63 AMG S—which is, of course, the whole point of these Performance packages. It’s certainly not about your average driver actually feeling the difference between the “regular” M5 and the competition car. The M logo, which at one time stood for the “motorsport” at BMW, now just stands for Money, and in this case, more bragging rights. There will be plenty of wealthy buyers that will pony up whatever the premium BMW will charge for a fraction of a second improvement in performance. Their ridiculously powerful car will get a hair more ridiculous. Call me when they put a competition package on a minivan!